This beautiful gem-embedded colorful Buddha pendant is Green Tara sitting on lotus with Buddha light in her back. The feng shui pendant is made of alloy. 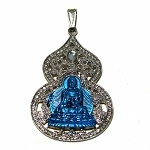 The dimension of this Buddha pendant is approx. 2" x 2 1/2"